I actually enjoyed this on the second go. 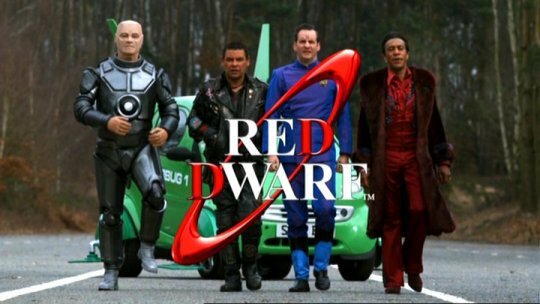 Red Dwarf: Back to Earth wasn’t a huge success with me when first broadcast. Thinking this was the last shout of the programme, I’d hoped for more resolution in the story but today, my only real quibble is that the show is presented without an audible audience. In the commentary to the series before this, Chris Barrie (Rimmer) notes how important an audience is for bringing energy to the comedy. Presumably it wasn’t an option when creator Doug Naylor was offered the chance to bring Red Dwarf back after a decade’s absence. And the age that the decade put on the performers’ faces? No longer a surprise; they’re lovely. Sitcom studio audiences are usually given half an hour of ‘warm up’ with a stand-up comedian so when the show proper starts, they’re super receptive to it. For us at home, that early laughter is our warm up and it's sorely missed in Back to Earth. Having loads of new visual detail to look at in the high def ‘Director’s Cut’ helped somewhat. Knowing that this isn’t the end for Red Dwarf made the ending (no spoilers) more satisfying to me. Also helpful is that the original three episodes have been combined into a 70-minute feature. It plays like a funny, surreal drama rather than a sitcom and perhaps the lack of a laugh track is okay after all. It makes this version of Back to Earth the Red Dwarf movie that Doug Naylor had tried for years to make. Channel 26 is a non-commercial fan studio.